The Samsung SP-H03 is a decent example of a business grade mini projector. It has a couple of shortcomings that would make it more usable, but nothing major. Because of these though, we couldn't in good faith give it the rating it probably deserved given the rest of the awesome features. For a very tiny projector that would be great to take on the road for you, it's perfect. For a first foray into mini projectors Samsung have release the SP-H03. It’s a little cube of a projector, very tiny to befit it’s description of “pico” or as we like to refer to it as a mini projector. Samsung are usually quite known for putting out great consumer electronic devices like these. Their TVs are spectacular after all, so shouldn’t their mini projectors be just as good? Well, let’s get stuck into the features to see what we came up with. The Samsung SP-H03 is a cute little thing. It’s about 3″ x 3″ x 1.5″ (7.5cm x 7.5cm x 3.8cm) so it really is tiny and fits into the palm of your hand. It’s light weight as well sitting at only 6.4 ounces (~200 grams) which is one of the lightest we’ve reviewed. It looks sweet as well, it’s all flush controls, it’s shiny black and metallic feeling and seems to be well made. The controls on the top of the unit are touch sensitive controls, so no buttons to break and it’s all back lit blue in the Samsung style of most of their newer electronics devices. Connectivity options abound, there’s a little flap on the back that sits flush with the unit. It’s a bit hard to open is the complaint you’ll often hear, but it’s ok if you have nails. The controls aren’t aligned very well, we were kind of hoping to see a HDMI connector here as well as there’s probably just enough room for a mini HDMI. But alas, you can achieve connection in a multitude of other ways. There’s a SD card input on the right hand side supporting up to 16GB cards along with a little slider to fine adjust the focus. Now, let’s move onto optics. Unfortunately this is where I get a little crabby. Everything about this projector says top class, it’s light, it’s connectable. Why then would they cripple it with a slightly below average 30 ANSI lumens of brightness? It’s not that it’s not bright at all, but it could be brighter. Some of this projector’s competitors, which are similarly priced like the Optoma ML500 (true, a slightly larger unit) and the Acer K11 (probably the most similar), are all sporting over 200 ANSI lumens which does make quite a big difference when the room you’re in doesn’t have ideal lighting. The other downer is that there is no software keystone adjustment which means unless the wall you’re projecting on is remarkably flat you’ll need to buy the optional tripod stand to get a perfectly square image. The Samsung SP-H03 has a native resolution of 854 x 480 pixels(WVGA) and 1,000:1 contrast ratio which again is decent but could be better at this price. Back to the positives though, the software on this unit is really good. You can play videos and view images as expected and also look at documents. You can hook it up to your gaming console, or flip cam, or digital camera and view these things without having to tether to a PC or laptop. There’s also 1GB of internal storage so you can store your videos, presentations, etc and play on the go. The rechargeable battery is actually pretty decent with 2 hours life and the onboard speaker is only 1W but apparently delivers decent sound. I find that hard to believe but it has a headphone socket so you’re safe there. Kudos to Samsung for including that. 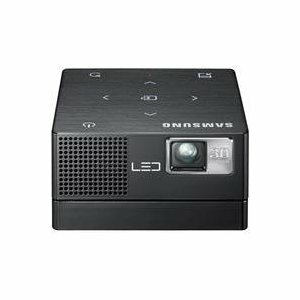 The Samsung SP-H03 is a LED driven DLP projector. It’s display technology is driven by 3 panel LCD with p-Si TFT Active-matrix. You will get an average 30,000 hours out of the light source which is the typical range for mini projectors. The image aspect ratio is 16:9 widescreen which is good because pretty much every device out there these days outputs widescreen ratios.